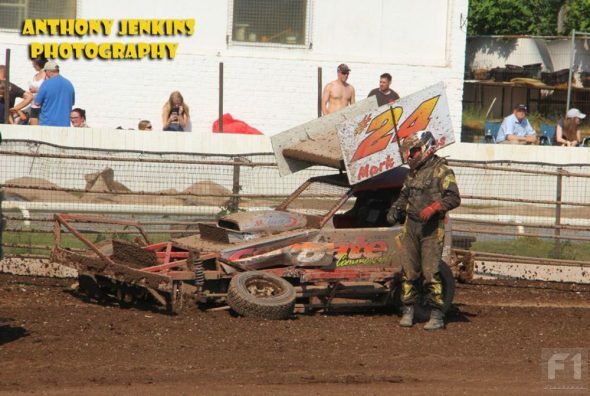 Another Bank Holiday Monday, another Belle Vue. Thankfully Manchester seemed to have escaped the biblical weather suffered elsewhere in the country and the Kirky Lane stadium was bathed in glorious sunshine. Before the racing I had the pleasure of meeting Pete Hearn whilst lurking at the VSCA stall. 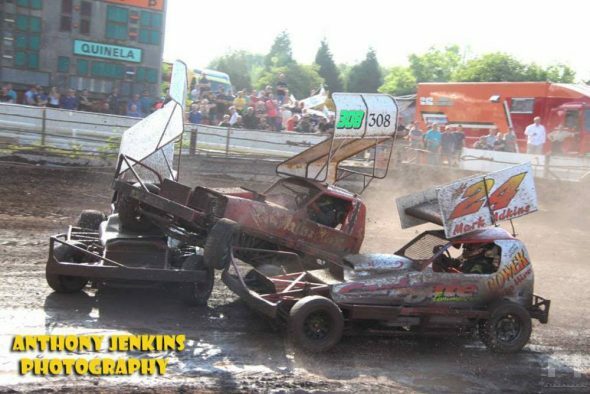 Pete was a superfan, writer and if memory serves, a lap scorer back in the halcyon days when stock car drivers only had one car whatever the surface, HANS was the name of your German pen-pal and stagger was something you did when you came out of the bar! But, as always, I digress. 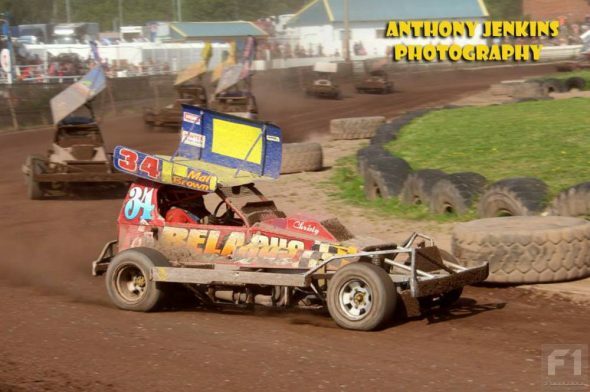 One driver who seems to prefer one surface is Clitheroe’s Richard Bryan (238) who followed up his grand national win at the last Belle Vue session with a convincing win in the 20 car opening heat of this World qualifier, leading from almost the green flag. 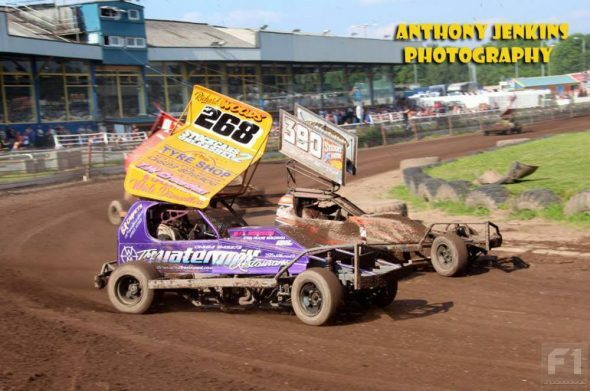 FWJ (515) retired to the infield at the halfway and it was left to Mat Newson (16) to chase the 238 car home with Mark Sargent (326) in third. 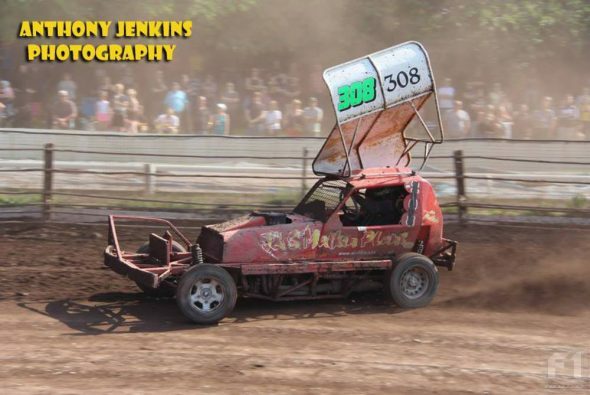 Mark Sargent (326) – still picking up the places from red top. 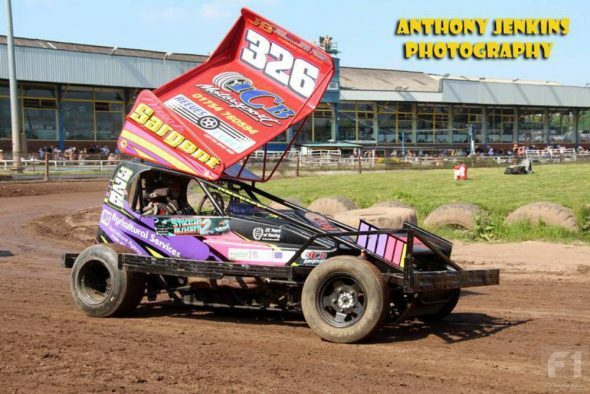 Heat two raised another 20 including Tristan Jackson (101) in the Eliot Smith car – let’s hope this does not signal the end of the 293 career. 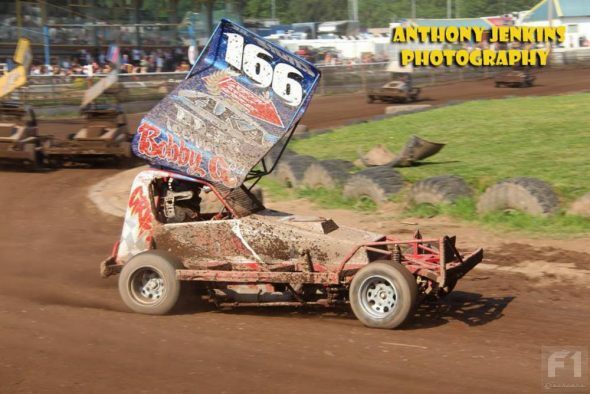 Bill Fenwick (57) was the early leader from Mike Heywood (424) until Rich Howarth (495) took over. Tom Harris (84) was quickly up to second, taking the lead at the half-way stage and then pulling swiftly onto the infield. 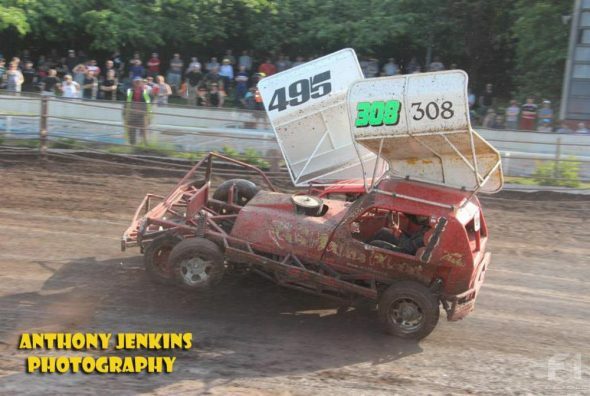 Stuart Smith (390) annexed the lead just before a caution for an errant silencer gave second-placed Dan Johnson (4) a shot at the 390 back bumper. 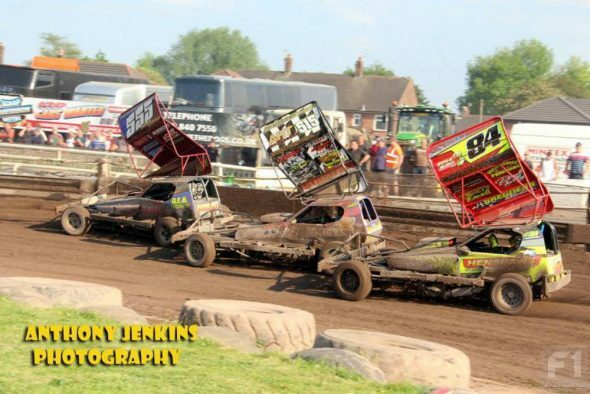 At the restart, Smith went, Johnson didn’t and Stuart was on his way to another Belle Vue victory while Dan limped onto the centre with a flat rear tyre. 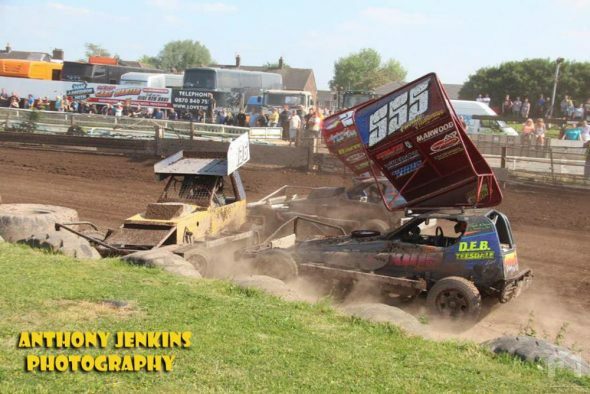 Sixteen made it out for the consolation but Dan Johnson wasn’t one of them – must have been a bit more than a flat tyre affecting the number 4 car. Jacklin (136) and Malkin (308) led the charge to the green flag. 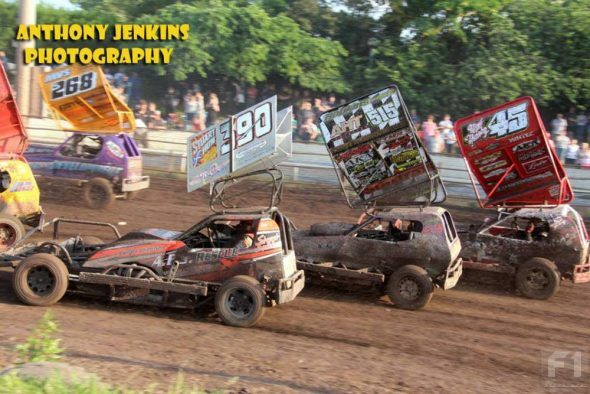 Malkin hitched a lift with Howarth and Adkins and Fenwick went head to head on turn four, collecting Frankie JJ (555) into the bargain. 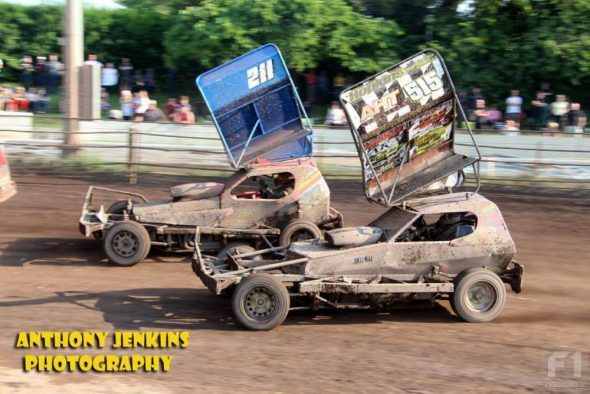 FWJ lost a lot of time behind a backmarker allowing Harris to pull away and surge after leader Nigel Whalley (198) with James Morris (463) holding second until Malkin (him again) and Adkins (and him) conspired to charge the back straight fence, bringing out the yellow flags. Whalley maintained a rule book rolling lap, not going until the green was shown (how often do we see that? 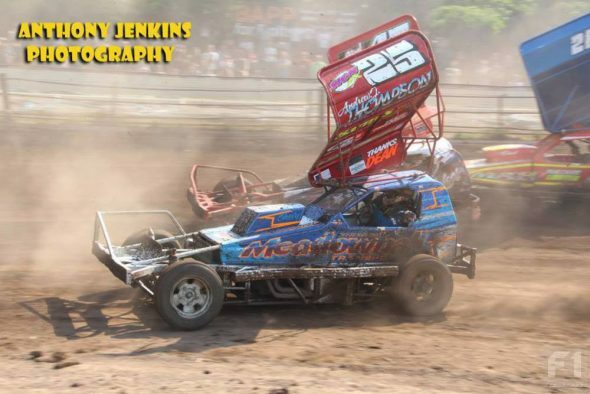 ), leading as far as the pit bend before Morris took over briefly until Harris passed him around half way. 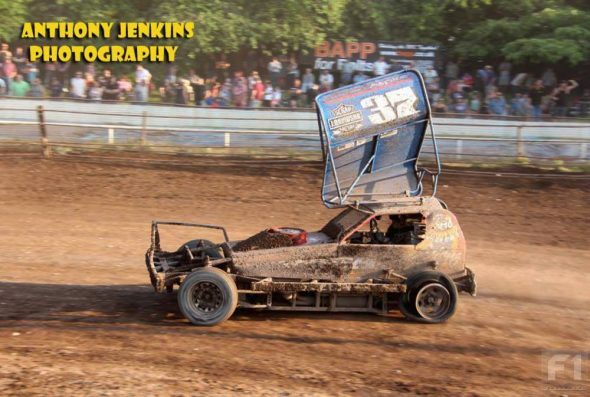 Chris Cowley (37) put the 198 car into the wires then turned his attention to Phoebe Wainman (211) as FWJ went second, too far behind to worry Harris who romped to victory. 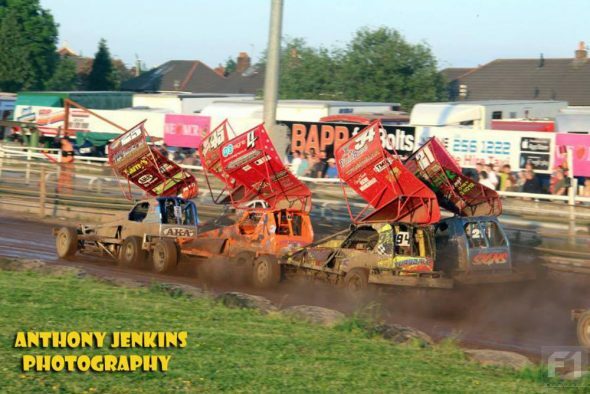 With half the field in the Mike Parker Memorial trophy final made up of red tops it was perhaps wishful thinking of me to hope lone white top Heywood could race to victory. He led the opening laps, getting a better start than Newson who took a diversion onto the infield, returned and was spun by Smith. Phoebe W ground to halt on the start line, bringing out the first caution. When racing recommenced Harris and Fairhurst delayed each other on the tote bend, leaving Smith, in ebullient form, to barge and bluster his way forwards. 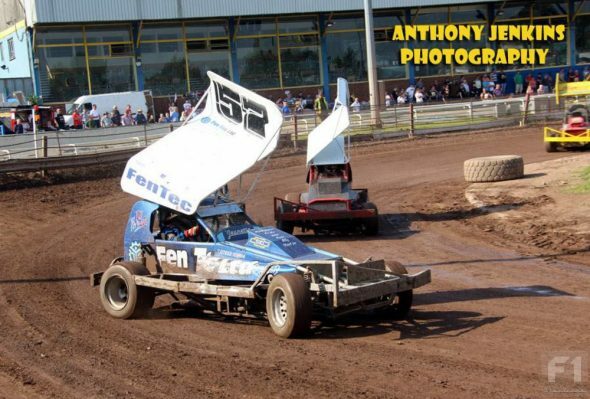 John Thompson (312) took the lead, then promptly lost it as FWJ tangled with Dowson (94) and Danny W (212). 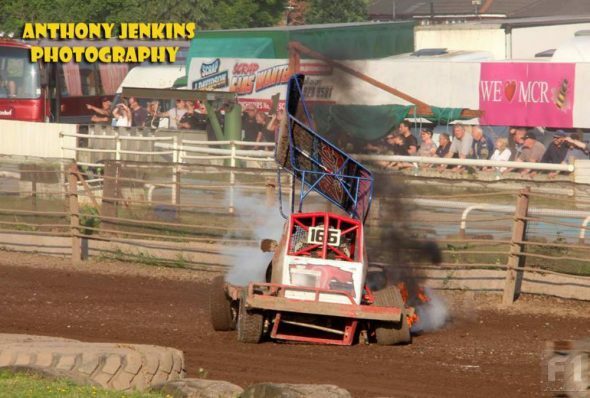 It was not a good race for Team Wainman as Frankie JJ crashed out on the Tote bend and Junior limped onto the centre. 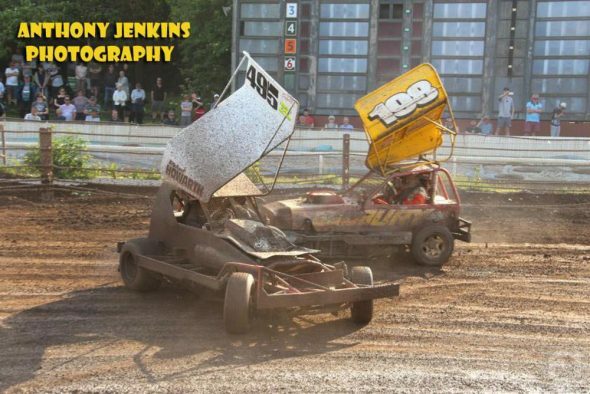 Heywood kept his head and the lead until he too joined the tote bend car park, putting Bobby G (166) in the top spot, just ahead of Smith. Smith passed Griffin with Hunter (220) in third and you would have thought that was that, but the 390 car was baulked coming off turn four and Griffin was back in front, but not for long. 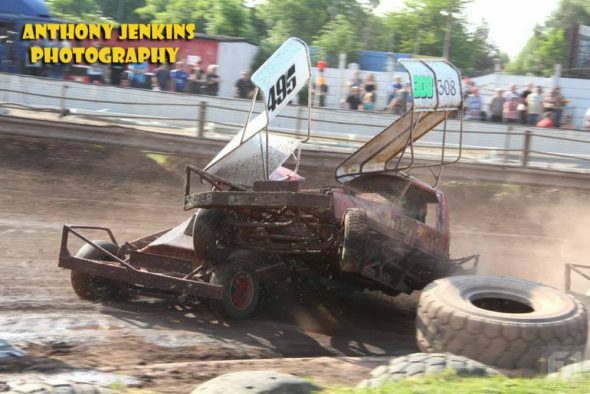 Smith drew level with the 166 car around the tote bend, they tangled as they entered the back straight and piled heavily into the fence, bits of metal flying into the air with one piece even reaching the home straight! It could have been nasty but thankfully no-one was hurt. 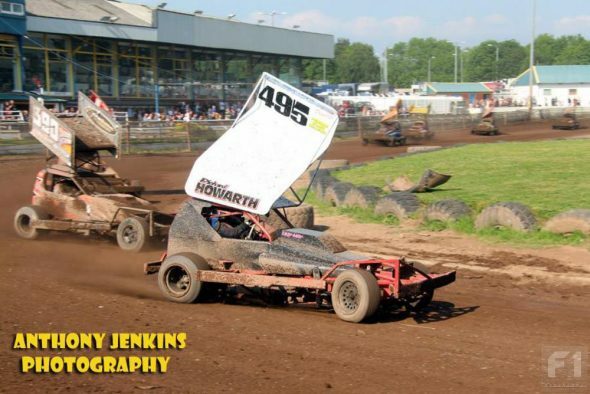 After a delay to remove the Griffin car and repair the fence, the race resumed with 6 to run with Morris (463) now in the lead ahead of Harris, Smith having retired with a flat front tyre. Harris eased Morris wide on the first bend and powered away to the flag with Paul Hines (259) second and Fairhurst third, just, from Morris. 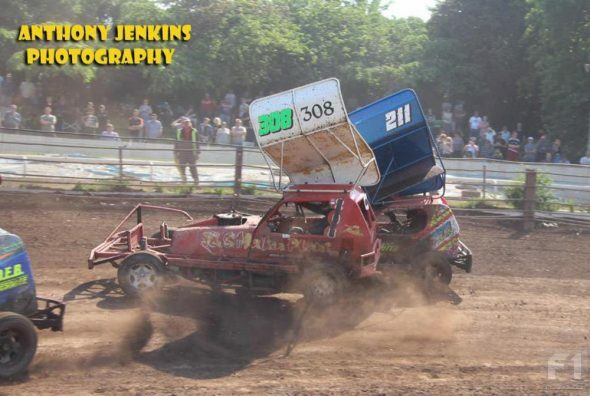 Richard Bryan lost it on the back straight as the green flag dropped for the grand national, while 212 and 555 both spun. 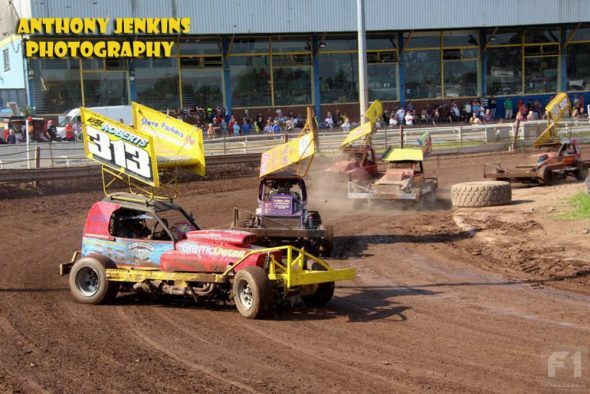 With Frankie JJ stranded mid track on turn three and with other cars piling in the yellow flags were shown. 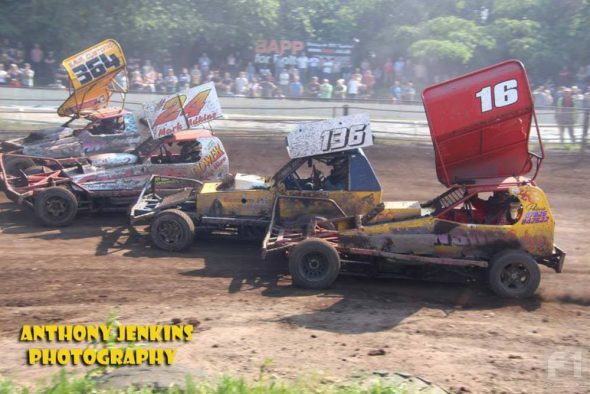 Malkin and Richard Woods (268) disputed the lead at the restart then promptly put each other out, Brad Harrison (25) and Newson had a coming together on the home straight and Jackson put the 101 car in the fence on the back straight. 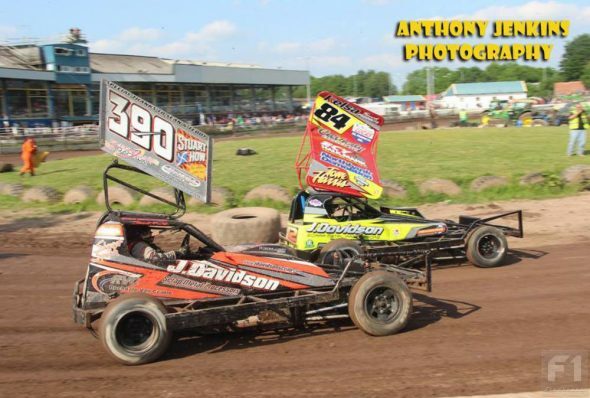 Robert Plant (364) led the way now until a rejuvenated Dan Johnson took over at the half way stage, just before another caution for Thompson (312), facing the oncoming traffic brought the race to a halt. 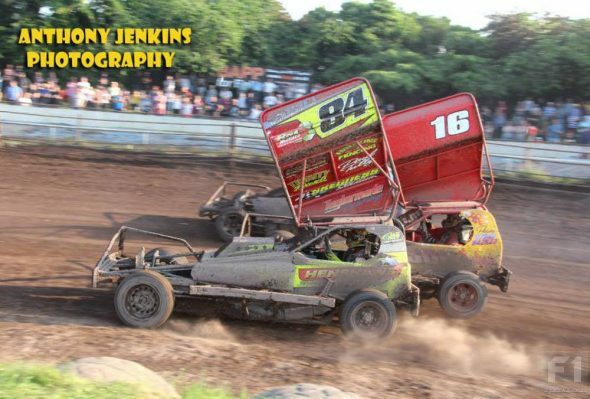 Johnson benefitted from back marker Cooper (415) stuttering at the green to pull out a healthy lead but it was final winner Harris who was making hay while the sun shone, or to more precise making up places hand over fist. 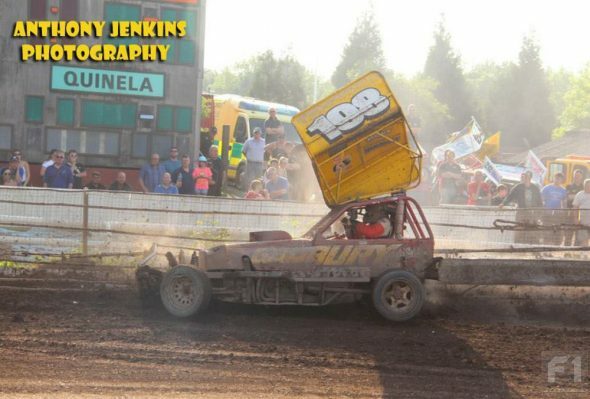 Johnson won with Smith second while FWJ tried to nail the 84 car as they neared the chequered flag. The move failed and Harris notched up an impressive third place.